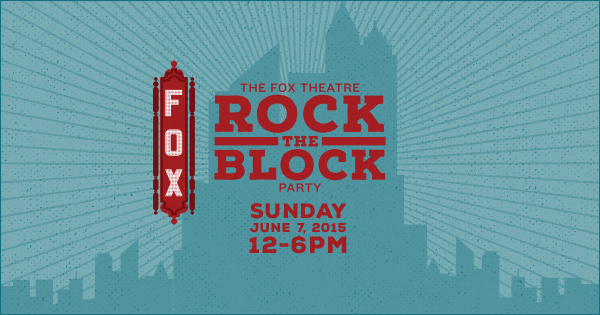 The Fox Theatre is throwing a free block party for the Atlanta community this Sunday, June 7 from noon – 6pm as a special thank you to the city for supporting the Save The Fox campaign in 1974-1975! This block party is also an opportunity to share the iconic building with a new generation of fans. Back in 1974, the future of The Fox Theatre was uncertain. Citizens rallied to “Save the Fox” and raised $1.85 million to restore the beloved Atlanta landmark, which resulted in the Fox’s triumphant return in 1975 as an opulent performance venue. The block party is free and will provide guests the opportunity to experience the magic of the Fox through live entertainment on two stages, special tours, food and drinks, activities, and prizes. The music lineup includes Francine Reed, Bogey & the Viceroy, Orquesta MaCuba, and Tribute – A Celebration of the Allman Brothers Band. The event will take place rain or shine at the intersection of Peachtree Street NE and Ponce De Leon Avenue, an area that historically represents the heart of Atlanta. Both streets will be closed at the intersection to vehicle traffic and the main entrance will be at Peachtree Street NE and 3rd Street NE. For more information, including FAQ, visit: foxtheatre.org/fox-theatre-block-party/.